Lama Zopa Rinpoche with Thubten Rigsel Rinpoche, Khen Rinpoche Geshe Chonyi, and Losang Namgyal Rinpoche, Kopan Monastery, Nepal, March 2017. Photo by Ven. Lobsang Sherab. Affiliate Area Highlight: Are You Creating the Causes of Success? Another Fruitful Foundation Service Seminar! Please join in reciting the prayers recently advised to help create the conditions for Lama Zopa Rinpoche to have good health for the coming year. In related news, Rinpoche gave a wonderful teaching on the lojong text Seven-Point Mind Training in February 2017 at Root Institute in Bodhgaya, India. We are delighted to bring you the video of this very special teaching. It’s possible that Rinpoche gave this teaching in response to the request made at the instigation of Khadro-la (Rangjung Neljorma Khadro Namsel Drönme) during the long life puja offered to Rinpoche in March 2016. Lama Zopa Rinpoche explained the benefits of circumambulation at a thank-you dinner offered by Kopan Monastery, Nepal. Rinpoche then led 200 to 300 people in circumambulating the Boudhanath Stupa at midnight, March 2017. Photo by Ven. Lobsang Sherab. 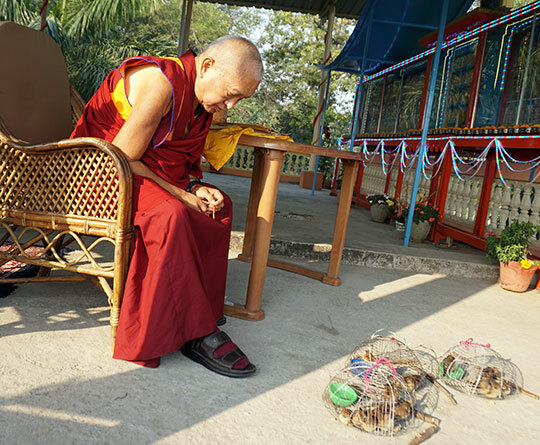 Lama Zopa Rinpoche blessing birds in Bodhgaya, India, January 2017. Photo by Ven. Lobsang Sherab. The birds are released from the cages after being blessed. 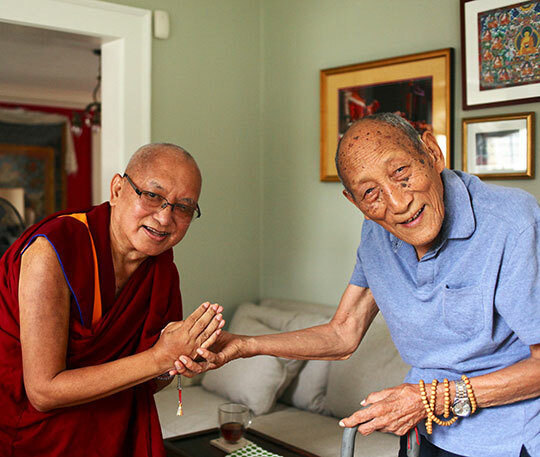 Lama Zopa Rinpoche visiting Khyongla Rato Rinpoche on Chokhor Duchen to respectfully make offerings to a beloved guru, New York, USA, August 2016. Photo by Ven. Lobsang Sherab. 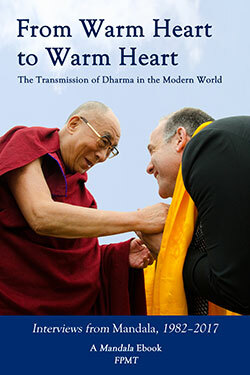 From Warm Heart to Warm Heart: The Transmission of Dharma in the Modern World takes a look at the diverse challenges of transmitting the Dharma from its traditional Tibetan setting into the modern world. This collection includes interviews with some of Tibetan Buddhism’s most popular teachers, practitioners, and scholars, including Lama Yeshe, Geshe Lhundub Sopa, Yangsi Rinpoche, Ven. Thubten Chodron, and many more, with a foreword by Lama Zopa Rinpoche. While all seventeen pieces have been previously published, many, never digitized, have until now existed only in long-forgotten print editions of Mandala. This and all four of Mandala ebooks are offered to Friends of FPMT at the e-Friends level and higher, and to Mandala magazine’s center packages recipients. In addition, Mandala ebooks can now be purchased individually through the FPMT Foundation Store, Amazon’s Kindle store, and will soon be available through Apple’s iBooks, Barnes and Noble, Kobo, Aldiko, OverDrive, and other ebook outlets. Thanks to Wisdom Publications and Lama Yeshe Wisdom Archive, the FPMT Foundation Store now has Lama Yeshe’s and Lama Zopa Rinpoche’s titles available in ebook formats. Get them today with free electronic delivery! Affiliate Area Highlights: Are You Creating the Causes of Success? Are you following Rinpoche’s advice for practices to create the causes of success at your center, project, service, or study group? Ven. Chantal, director of the International Mahayana Institute (IMI), the community of monks and nuns of the FPMT, recently sent out an update on IMI activities via the CPMT e-group, which you can also read here. 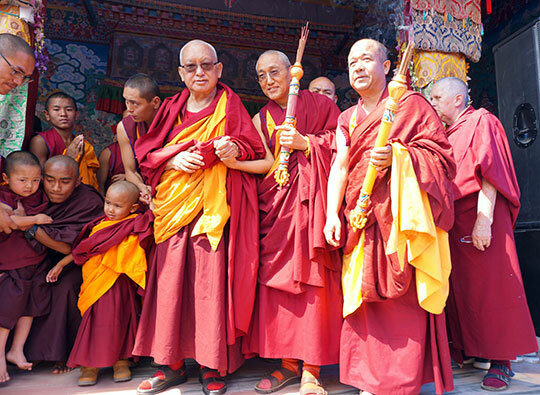 FPMT’s International Sangha Day will be celebrated on Chokhor Duchen (the First Turning of the Wheel of Dharma), which this year is on July 27. If your center may need a trained interpreter in the next year, please respond to the update that Yaron Bahir, director of LRZTP, recently sent via the CPMT e-group! Congratulations to Luz de Nagarjuna (Nagarjuna’s Light) in Spain, which has made the transition from study group to center. Gyumed Khensur Rinpoche Lobsang Jampa will be teaching for ten days on Chandrakirti’s Madhyamakavatara at Guhyasamaja Center, USA. Mahamudra Centre, New Zealand, is hosting a Vajrayogini Approach Retreat and a Yamantaka Solitary Hero Approach Retreat. Find these and other retreats listed here. Students from Australia and Tahiti joined New Zealand students at the recent Foundation Service Seminar hosted by Mahamudra Centre in New Zealand! 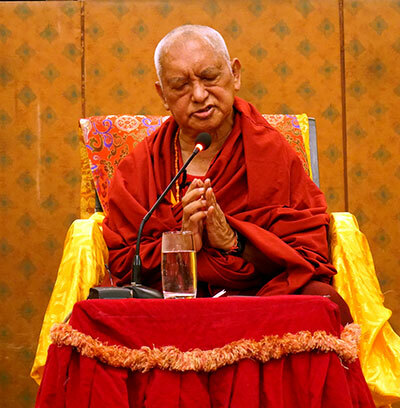 FPMT Education Services: a practice that Lama Zopa Rinpoche has been emphasizing students to focus on, How to Make Life Most Beneficial for Sentient Beings, Even with Your Speech, is now available in Khmer. FPMT Center Services: the “Ethics and Ethical Policy” section of the Affiliates Area is now available in Tibetan in the Geshe Pack. Mandala: recently published online “Interview mit Dieter Kratzer: Wie es dazu kam, dass er Dharma Lehrer wurde,” an interview with long-time FPMT registered teacher Dieter Kratzer. The original interview was published in English in January 2017. Please check out the regularly updated meritorious opportunities to offer service as a volunteer or as paid staff in FPMT centers, projects, and services around the world. For example, Vajrapani Institute, USA, needs a housekeeper, a lead cook, a foreman, a community relations coordinator, and has a range of work-study positions open. Jamyang Buddhist Centre, UK, needs a volunteer coordinator.